Presented as one of the world’s finest 13-inch ultrabooks, the Asus Zenbook 13 hits even more with its Zenbook UX331UAL (L for light), which totals barely 1 kilo. Asus unveils a new productive desktop release with the Asus Zenbook UX331UAL-EG003T. It is based on a Kaby Lake Refresh i5 Core i5, on 8 GB of RAM and on a dedicated SSD of 256 GB. In front, a full HD IPS matte screen and its edges edge to edge reinforce the immersion. You can also count on an elegant blue hull and some welcome amenities like the fingerprint reader, USB Type-C and the comfort of a backlit keyboard. 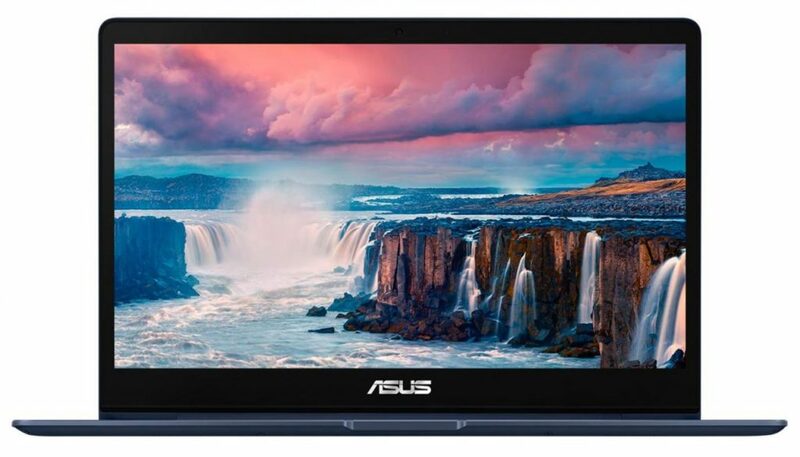 An excellent compromise between performance, elegance and mobility, the Asus Zenbook UX331UAL-EG003T is aimed at users looking for a responsive and ultra-compact ultrabook for nomadic office use. Its design is particularly neat and composed mainly of aluminum (plastic inside) to serve the robustness. Dressed in an original blue color, it stands out from the other ultrabooks on the market with a glossy concentric circle finish on the lid and a simpler base, matte and soft. It hosts a backlit keyboard on 3 shades for a comfortable typing in dark environment. But the charm of this ultrabook goes beyond the simple look to focus on its mobile propensity. Finer and lighter than the Dell XPS 13 (but not as compact) with just 1 kg and 14 mm thick, it can accompany you throughout the day without being felt. In this regard, Asus announces a boosted autonomy at 15 hours for its Zenbook UX331UAL, a record that can surely reach very light use. However, it will probably rely on 10 to 12 hours in active Web browsing, which is already very satisfactory especially given its small size. Behind a rather frail appearance, the Asus Zenbook UX331UAL-EG003T hides a good level of performance allowed by its Quad Core i5 Kaby Lake Refresh last generation supported by 8 GB of RAM . This duo is perfectly comfortable with office and multimedia tasks, including surfing the Internet, playing videos, working on Office or photo editing (Photoshop, Lightroom). It can also tackle other missions a little more demanding (Adobe Premiere) in reasonable proportions. By the way, lovers of multitaskingwill have all the ease necessary to multiply the tabs on the web and the active applications. Note the inherent limitations of the small chassis: the temperatures climb quickly and can limit the performance during a demanding use. Opposite, the 256 GB dedicated SSD is the guarantor of the responsiveness of the system. Overall quieter, more robust, and more energy efficient than a mechanical drive, it allows Windows to achieve a remarkable level of fluidity with short load times and latency-free operation. On the other hand, its capacity of storage can prove to be insufficient (256 Go) since after the installation of the OS and the programs, barely 200 Go will be able to be allocated to your playful files. For its part, the screen plays a decisive role in the aesthetic rendering of the ultrabook and its refined contours (NanoEdge) will amplify the sensation of immersion. It benefits from a Full HDdefinition (1920 x 1080 px) that takes advantage of a healthy display density to modulate the display or view in the best conditions of High Definition content. In addition, the anti- reflective coatingfacilitates viewing in bright ambient light and the IPS technology offers extended viewing angles and balanced colorimetry. The graphics part is based on the Intel UHD 620 chip integrated into the processor in the absence of a dedicated solution. Estimated at the height of a GeForce 920M, it will allow some casual players to launch some old titles and undemanding in Full HD with a nice fluidity (all the same for the small format). 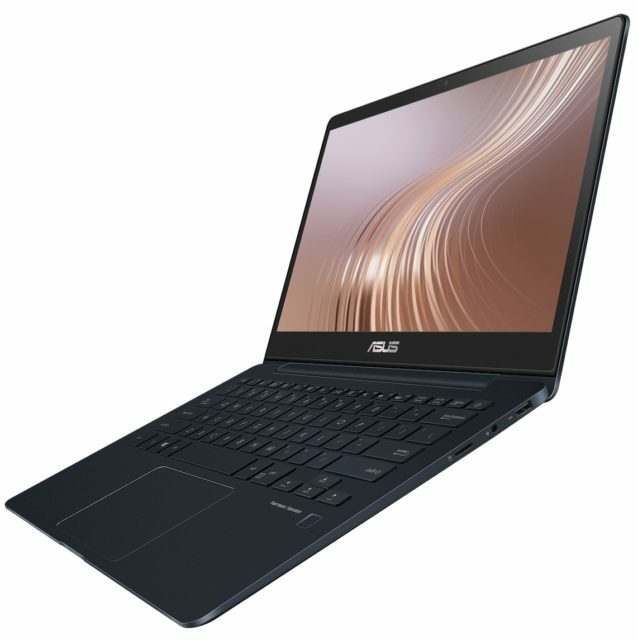 Finally, the connectivity of this Asus Zenbook UX331UAL-EG003T will focus the essentials in terms of interfaces. There is an HDMI output, a microSD card reader and two USB 3.1 ports. A USB 3.1 Type-C is also part and recent modules Wifi AC and Bluetooth 4.2. Do not forget the valuable addition of a fingerprint reader that secures and simplifies access to your session (Windows Hello compatible). In addition, a USB to LAN adapter is logically provided but this remains to be confirmed.